So here's the thing - I am one of those weird people who actually get a buzz out of filling out questionnaires. Although now I have opened my big mouth just watch as I am bombarded with surveys from random spam companies and I will be forced to eat my words. But I do like sitting down and thinking about the questions I'm asked and coming up with the answers. It gets me thinking about things I may not normally pay a lot of thought too and often I find I learn something new about myself too. I also love reading interviews with other people, because well basically I am a nosey bugger and I like a little voyeuristic peek into other people's heads. 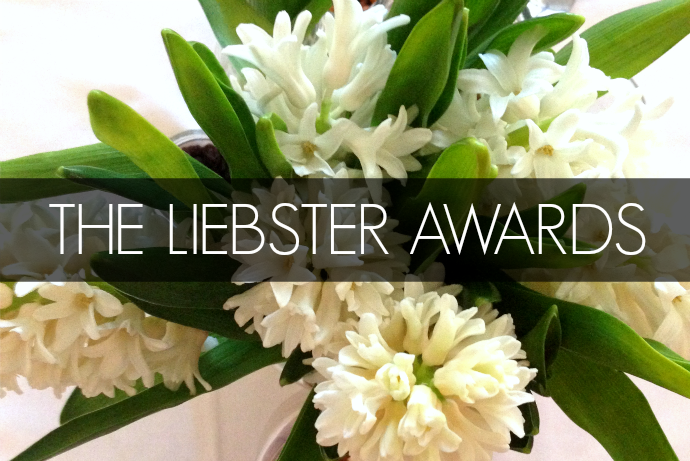 So anyway the lovely Kate from Raising Misters has nominated me for the Liebster Award - which is kind of like a bloggy game of catch. Someone fabulous passes you the award and a list of questions to answer. You spill your guts, create a new list of questions and pass the award onto another 10 people. And so it continues. I am however writing this on a Saturday night with a couple of heavy handed G&Ts under the belt so everything pretty much makes sense to me right now, it just may not exactly translate that way to you guys though. Anyhow... on to the questions. Absolutely 100 percent it's a Caprioska. I thank my Brazilian friend Marlos for introducing me to this drink and it was love at first sip. When my hubby brought Kai and Sam into the birthing suite to meet their brand new baby brother Flynn. Life could not be more perfect than it was at that single moment. 3. Song you never want to hear again? That would be Blister in the Sun by Violent Femmes. That song seriously grates at me as it reminds me of a time in my life that I would much rather forget. It is literally the only song that evokes such a strong negative response from me. 4. Favourite part about blogging? The friendships I have made both through my blog and through other's blogs and online. Never ever would I have imagined I would make such beautiful connections with strangers. Definitely my engagement ring as it was an old family heirloom. 6. If you could pick a dream job, what would yours be? A talk show host. I like to talk and I am nosy. Perfect job for me. OK now this is a little embarrassing. I have been wearing this perfume for about 8 years now and people always ask me what it is. Usually I just say the perfume name and not who it is by because... well that's the embarrassing bit - it is Fantasy by Britney Spears. She actually partnered with the design house of Giorgio Armani to create this fragrance so in my defence, it does have some credibility haha. Oceans all the way, although I don't want to actually be out in the middle of the ocean because I get sea sick and tend to puke. I'm happiest on the shore or in the shallows. Hmmm I would pretty much take any holiday on offer at this moment but my dream holiday would involve spending a week in a loft apartment in New York followed by a week lounging around at Turtle Bay in Hawaii. OK So here's the bit where I officially toss the ball to ten other bloggers to play along BUT I want to encourage everyone to play along by answering all or some of the questions in the comments below or on your blog as I love getting to know you guys better. Get an award button and display it proudly. If you could live anywhere in the word where would you choose? You are granted three wishes, what would you wish for? What 3 words do you think people would use to describe you? Ghosts - Do you believe in them or not? I would love you to play along by answering all or some of the questions in the comments below.